Until April 21st, save 30% on the thousands of everyday essential items available in this page. Appliances are excluded. 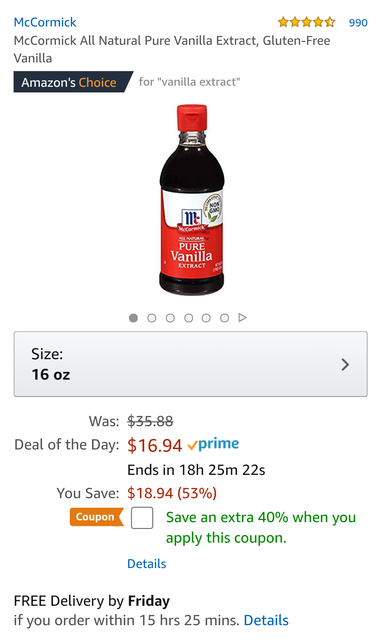 The offer only applies to products shipped and sold by Amazon.com and for a maximum discount of $150. See complete Terms & Conditions below. Offer only applies to products available at www.amazon.com/b?node=18776746011 sold by Amazon.com or Amazon Digital Services LLC (look for “sold by Amazon.com” or “sold by Amazon Digital Services LLC” on the product detail page). Products sold by third-party sellers or other Amazon entities will not qualify for this offer, even if “fulfilled by Amazon.com” or “Prime Eligible”. Offer does not apply to appliances. Offer only valid on first purchase of everyday essentials. Offer only valid for invited Amazon customers who have received this offer directly from Amazon through email or online display advertisements. Clip the coupon of 42% off. Clip the coupon of 44% off. Any Machine from Nespresso.com are on sale for 50% ! to receive an additional 20% discount. i will like to know what is my best option regarding "protection and extended warranty" to buy a cellphone. it will be from the Fi deal and i will finance the phone (the plan is to pay in full in a few months).